This page is about the British House of Lords. For other uses, see House of Lords (disambiguation). The House of Lords of the United Kingdom, referred to ceremonially as the House of Peers, is the upper house of the Parliament of the United Kingdom. Like the House of Commons, it meets in the Palace of Westminster. Officially, the full name of the house is: The Right Honourable the Lords Spiritual and Temporal of the United Kingdom of Great Britain and Northern Ireland in Parliament assembled. Unlike the elected House of Commons, all members of the House of Lords (excluding 90 hereditary peers elected among themselves and two peers who are ex officio members) are appointed. The membership of the House of Lords is drawn from the peerage and is made up of Lords Spiritual and Lords Temporal. The Lords Spiritual are 26 bishops in the established Church of England. Of the Lords Temporal, the majority are life peers who are appointed by the monarch on the advice of the Prime Minister, or on the advice of the House of Lords Appointments Commission. However, they also include some hereditary peers including four dukes. Membership was once an entitlement of all hereditary peers, other than those in the peerage of Ireland, but under the House of Lords Act 1999, the right to membership was restricted to 92 hereditary peers. Very few of these are female since most hereditary peerages can only be inherited by men. While the House of Commons has a defined 650-seat membership, the number of members in the House of Lords is not fixed. There are currently Expression error: Unrecognized punctuation character "[". sitting Lords. The House of Lords is the only upper house of any bicameral parliament to be larger than its respective lower house. The House of Lords scrutinises bills that have been approved by the House of Commons. It regularly reviews and amends Bills from the Commons. While it is unable to prevent Bills passing into law, except in certain limited circumstances, it can delay Bills and force the Commons to reconsider their decisions. In this capacity, the House of Lords acts as a check on the House of Commons that is independent from the electoral process. Bills can be introduced into either the House of Lords or the House of Commons. Members of the Lords may also take on roles as government ministers. The House of Lords has its own support services, separate from the Commons, including the House of Lords Library. The Queen's Speech is delivered in the House of Lords during the State Opening of Parliament. In addition to its role as the upper house, until the establishment of the Supreme Court in 2009, the House of Lords, through the Law Lords, acted as the final court of appeal in the British judicial system. The House also has a Church of England role, in that Church Measures must be tabled within the House by the Lords Spiritual. Today's Parliament of the United Kingdom largely descends, in practice, from the Parliament of England, though the Treaty of Union of 1706 and the Acts of Union that ratified the Treaty in 1707 created a new Parliament of Great Britain to replace the Parliament of England and the Parliament of Scotland. This new parliament was, in effect, the continuation of the Parliament of England with the addition of 45 MPs and 16 Peers to represent Scotland. The Parliament of England developed from the Magnum Concilium, the "Great Council" that advised the King during medieval times. This royal council came to be composed of ecclesiastics, noblemen, and representatives of the counties of England and Wales (afterwards, representatives of the boroughs as well). The first English Parliament is often considered to be the "Model Parliament" (held in 1295), which included archbishops, bishops, abbots, earls, barons, and representatives of the shires and boroughs of it. Further developments occurred during the reign of Edward II's successor, Edward III. It was during this King's reign that Parliament clearly separated into two distinct chambers: the House of Commons (consisting of the shire and borough representatives) and the House of Lords (consisting of the bishops and abbots and the peers). The authority of Parliament continued to grow, and, during the early fifteenth century, both Houses exercised powers to an extent not seen before. The Lords were far more powerful than the Commons because of the great influence of the great landowners and the prelates of the realm. Entire cities such as Manchester were not represented by a single individual in the House of Commons, but the 11 voters of Old Sarum retained their ancient right to elect two members of parliament. A small borough was susceptible to bribery, and was often under the control of a patron, whose nominee was guaranteed to win an election. Some aristocrats were patrons of numerous "pocket boroughs", and therefore controlled a considerable part of the membership of the House of Commons. Before the new peers were created, however, the Lords who opposed the bill admitted defeat, and abstained from the vote, allowing the passage of the bill. The crisis damaged the political influence of the House of Lords, but did not altogether end it. 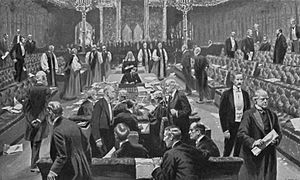 A vital reform was effected by the House itself in 1868, when it changed its standing orders so as to prevent noble Lords from voting without taking the trouble to attend. Proxies were then abolished. Over the course of the century the power of the Upper House experienced further erosion,[how?] and the Commons gradually became the stronger House of Parliament. When Michael Foot attained the leadership of the Labour Party in 1980, abolition of the House of Lords became a part of the party's agenda; under his successor, Neil Kinnock, however, a reformed Upper House was proposed instead. In the meantime, the creation of hereditary peerages (except for members of the Royal Family) has been arrested, with the exception of three creations during the administration of the Conservative Margaret Thatcher in the 1980s. Whilst some hereditary peers were at best apathetic the Labour Party's clear commitments were not lost on Baron Sudeley, who for decades was considered an expert on the House of Lords. In December 1979 the Conservative Monday Club published his extensive paper entitled Lords Reform – Why tamper with the House of Lords? and in July 1980 The Monarchist carried another article by Lord Sudeley entitled Why Reform or Abolish the House of Lords?. In 1990 he wrote a further booklet for the Monday Club entitled The Preservation of the House of Lords. Since 1999, however, no further reform has taken place. The Wakeham Commission proposed introducing a 20% elected element to the Lords, but this plan was widely criticised. A Joint Committee was established in 2001 to resolve the issue, but it reached no conclusion and instead gave Parliament seven options to choose from (fully appointed, 20% elected, 40% elected, 50% elected, 60% elected, 80%, and fully elected). In a confusing series of votes in February 2003, all of these options were defeated, although the 80% elected option fell by just three votes in the Commons. Socialist MPs favouring outright abolition voted against all the options. In 2005, a cross-party group of senior MPs (Kenneth Clarke, Paul Tyler, Tony Wright, Sir George Young and Robin Cook) published a report proposing that 70% of members of the House of Lords should be elected – each member for a single long term – by the single transferable vote system. Most of the remainder were to be appointed by a Commission to ensure a mix of "skills, knowledge and experience". This proposal was also not implemented. A cross-party campaign initiative called "Elect the Lords" was set up to make the case for a predominantly elected Second Chamber in the run up to the 2005 general election. On 30 November 2009, a Code of Conduct for Members of the House of Lords was agreed by them; certain amendments were agreed by them on 30 March 2010 and on 12 June 2014. The scandal over expenses in the Commons was at its highest pitch only six months before, and the Labourite leadership under Janet Royall determined that something sympathetic should be done. In Meg Russell's article "Is the House of Lords already reformed? ", she states three essential features of a legitimate House of Lords. The first is that it must have adequate powers over legislation to make the government think twice before making a decision. The House of Lords, she argues, currently has enough power to make it relevant. During Tony Blair’s first year, he was defeated thirty-eight times in the Lords. Secondly, as to the composition of the Lords, Meg Russell suggests that the composition must be distinct from the Commons, otherwise it would render the Lords useless. The third feature is the perceived legitimacy of the Lords. She writes, "In general legitimacy comes with election." The size of the House of Lords has varied greatly throughout its history. From about 50 members in the early 1700s, it increased to a record size of 1,330 in October 1999, before Lords reform reduced it to 669 by March 2000. In August 2014, despite there being a seating capacity of only around 230 to 400 on the benches in the Lords chamber, the House had 774 active members (plus 54 who were not entitled to attend or vote, having been suspended or granted leave of absence). This made the House of Lords the largest parliamentary chamber in any democracy. In August 2014, former Speaker of the House of Commons Baroness Boothroyd requested that “older peers should retire gracefully” to ease the overcrowding in the House of Lords. She also criticised successive prime ministers for filling the second chamber with “lobby fodder” in an attempt to help their policies become law. She made her remarks days before a new batch of peers were due to be appointed. In August 2015, following the creation of a further 45 peers in the Dissolution Honours, the total number of eligible members of the Lords increased to 826. In a report entitled Does size matter? the BBC said: "Increasingly, yes. Critics argue the House of Lords is the second largest legislature after the Chinese National People's Congress and dwarfs Upper Houses in other bi-cameral democracies such as the United States (100 senators), France (348 senators), Australia (76 senators) and India (250 members). The Lords is also larger than the Supreme People's Assembly of North Korea (687 members). [… ] Peers grumble that there is not enough room to accommodate all of their colleagues in the Chamber, where there are only about 400 seats, and say they are constantly jostling for space – particularly during high-profile sittings", but added, "On the other hand, defenders of the Lords say that it does a vital job scrutinising legislation, a lot of which has come its way from the Commons in recent years". Exceptions include Lord Carrington, who was the Foreign Secretary between 1979 and 1982, Lord Young of Graffham (Minister without Portfolio, then Secretary of State for Employment and then Secretary of State for Trade and Industry from 1984 to 1989), Lady Amos, who served as Secretary of State for International Development and Lord Mandelson, who served as First Secretary of State, Secretary of State for Business, Innovation and Skills and President of the Board of Trade. George Robertson was briefly a peer whilst serving as Secretary of State for Defence before resigning to take up the post of Secretary General of NATO. From 1999 to 2010 the Attorney General for England and Wales was a Member of the House of Lords; the most recent was Baroness Scotland of Asthal. Similarly, the House of Lords was once the court that tried peers charged with high treason or felony. The House would be presided over not by the Lord Chancellor, but by the Lord High Steward, an official especially appointed for the occasion of the trial. If Parliament was not in session, then peers could be tried in a separate court, known as the Lord High Steward's Court. Only peers, their wives, and their widows (unless remarried) were entitled to trials in the House of Lords or the Lord High Steward's Court; the Lords Spiritual were tried in Ecclesiastical Courts. In 1948, the right of peers to be tried in such special courts was abolished; now, they are tried in the regular courts. The last such trial in the House was of Edward Southwell Russell, 26th Baron de Clifford in 1935. An illustrative dramatisation circa 1928 of a trial of a peer (the fictional Duke of Denver) on a charge of murder (a felony) is portrayed in the 1972 BBC Television adaption of Dorothy L. Sayers' Lord Peter Wimsey mystery Clouds of Witness. Members of the House of Lords who sit by virtue of their ecclesiastical offices are known as Lords Spiritual. Formerly, the Lords Spiritual were the majority in the English House of Lords, comprising the church's archbishops, (diocesan) bishops, abbots, and those priors who were entitled to wear a mitre. After the English Reformation's highpoint in 1539, only the archbishops and bishops continued to attend, as the Dissolution of the Monasteries had just disproved of and suppressed the positions of abbot and prior. In 1642 during the few Lords' gatherings convened during English Interregnum which saw periodic war, the Lords Spiritual were excluded altogether, but they returned under the Clergy Act 1661. The current Lords Spiritual represent only the Church of England. Bishops of the Church of Scotland traditionally sat in the Parliament of Scotland but were finally excluded in 1689 (after a number of previous exclusions) when the Church of Scotland became permanently presbyterian. There are no longer bishops in the Church of Scotland in the traditional sense of the word, and that Church has never sent members to sit in the Westminster House of Lords. The Church of Ireland did obtain representation in the House of Lords after the union of Ireland and Great Britain in 1801. Of the Church of Ireland's ecclesiastics, four (one archbishop and three bishops) were to sit at any one time, with the members rotating at the end of every parliamentary session (which normally lasted approximately one year). The Church of Ireland, however, was disestablished in 1871, and thereafter ceased to be represented by Lords Spiritual. Bishops of Welsh sees in the Church of England originally sat in the House of Lords (after 1847, only if their seniority within the Church entitled them to), but the Church in Wales ceased to be a part of the Church of England in 1920 and was simultaneously disestablished in Wales. Accordingly, bishops of the Church in Wales were no longer eligible to be appointed to the House as bishops of the Church of England, but those already appointed remained. Other ecclesiastics have sat in the House of Lords as Lords Temporal in recent times: Chief Rabbi Immanuel Jakobovits was appointed to the House of Lords (with the consent of the Queen, who acted on the advice of Prime Minister Margaret Thatcher), as was his successor Chief Rabbi Jonathan Sacks. Baroness Neuberger is the Senior Rabbi to the West London Synagogue. In recognition of his work at reconciliation and in the peace process in Northern Ireland, the Archbishop of Armagh (the senior Anglican bishop in Northern Ireland), Lord Eames was appointed to the Lords by John Major. Other clergymen appointed include the Reverend Donald Soper, the Reverend Timothy Beaumont, and some Scottish clerics. 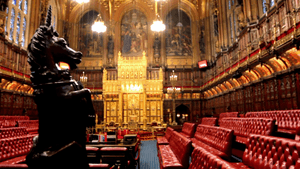 Of the 92, two remain in the House of Lords because they hold royal offices connected with Parliament: the Earl Marshal and the Lord Great Chamberlain. Of the remaining ninety peers sitting in the Lords by virtue of a hereditary peerage, 15 are elected by the whole House and 75 are chosen by fellow hereditary peers in the House of Lords, grouped by party. (If a hereditary peerage holder is given a life peerage, he or she becomes a member of the House of Lords without a need for a by-election.) The exclusion of other hereditary peers removed the Prince of Wales (who is also Earl of Chester) and all other Royal Peers, including the Duke of Edinburgh, Duke of York, Earl of Wessex, Duke of Gloucester and Duke of Kent. Women were excluded from the House of Lords until the Life Peerages Act 1958, passed to address the declining number of active members, made possible the creation of peerages for life. Women were immediately eligible and four were among the first life peers appointed. However, hereditary peeresses continued to be excluded until the passage of the Peerage Act 1963. Since the passage of the House of Lords Act 1999, hereditary peeresses remain eligible for election to the Upper House; there is one (Countess of Mar) among the 90 hereditary peers who continue to sit. In 2014, the House of Lords Reform Act 2014 made provision for members' resignation from the House, removal for non-attendance, and automatic expulsion upon conviction for a serious criminal offence (if resulting in a jail sentence of at least one year). In June 2015, under the House of Lords (Expulsion and Suspension) Act 2015, the House's Standing Orders may provide for the expulsion or suspension of a member upon a resolution of the House. By contrast with the House of Commons, the House of Lords has not until recently had an established procedure for putting sanctions on its members. When a cash for influence scandal was referred to the Committee of Privileges in January 2009, the Leader of the House of Lords also asked the Privileges Committee to report on what sanctions the House had against its members. After seeking advice from the Attorney General for England and Wales and the former Lord Chancellor Lord Mackay of Clashfern, the committee decided that the House "possessed an inherent power" to suspend errant members, although not to withhold a writ of summons nor to expel a member permanently. When the House subsequently suspended Lord Truscott and Lord Taylor of Blackburn for their role in the scandal, they were the first to meet this fate since 1642. There are currently Expression error: Unrecognized punctuation character "[". sitting members of the House of Lords. An additional 31 Lords are ineligible from participation, including eight peers who are constitutionally disqualified as members of the Judiciary. Of the initial 42 hereditary peers elected as Conservatives, one (Lord Willoughby de Broke) now sits as UKIP. House of Lords Facts for Kids. Kiddle Encyclopedia.